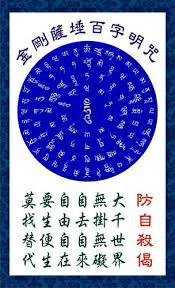 In the past few years, aoefengshui followed several ZWDS charts with depression and found that at least one of the related stars/palaces in their ZWDS charts was “broken”. The personalized treatment suggestions were designed for each chart accordingly. If you or someone you know is in crisis because of the depression, please feel free to contact me by Private Message or Email with gender, date of birth, time of birth and some background info. I will add your case into the research program and hopefully I can give you some free advice when I complete this program by the end of next year. I dont know chinese. Can you translate or at least write pin in of the above mentra. Try to search google (including the google picture) with key words ----- "vajrasattva mantra". thanks. Thank you master  I found it. I met someone who always feeling empty and feel lonely even this person already has good family and this person life already good. Its a part of depression if this person feeling like this? My suggestion: go for the online Checklist for Depression first.